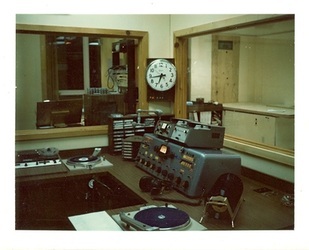 SUNY Adirondack's first radio station began as a carrier current radio station in the early 1970's. WACC (which stood for Adirondack Community College) could not be heard outside of the campus Student Center and operated only during school hours -- 8:00am to 8:00pm. 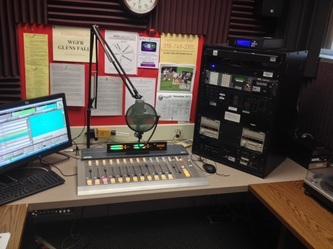 As student interested grew, the College applied to the FCC for an FM broadcast license. The FCC granted a construction permit and ACC's broadcast radio station hit the airwaves in the Glens Falls/Queensbury area on January 17, 1977, operating at 91.9 FM. WGFR (which stands for Glens Falls Radio) offered music - from jazz and classical to Country and Rock, local news, sports and public affairs programming. The studios and transmitter were located in the Student Center. Through funding from the Glens Falls Foundation and ACC's Faculty-Student Association, WGFR moved its transmitter to the CNA Building in downtown Glens Falls in 1983. The audio signal was delivered to the transmitter via a dedicated telephone line. Transmitter power was not increased from the original 10 watts, but the move improved the station's signal throughout the area. WGFR broadcast a mono signal. The expanded coverage area required moving to a new frequency -- 92.1 FM. The final frequency change came in 1994 to accommodate a start-up religious station. This time, WGFR moved up the radio dial, landing at our current home -- 92.7 FM. WGFR entered the world of stereo broadcasting at 10:44 a.m. on June 21, 2005, when a microwave STL (Studio-to-Transmitter Link) was powered up for the first time. Two years later, on July 2, 2007, WGFR launched its 24/7 web stream. Today WGFR has listeners around the globe. From its days as a carrier current operation in the Student Center to its local and web broadcasts, WGFR has provided a pre-professional learning environment for hundreds of students interested in the broadcasting industry. WGFR alumni work in commercial radio and television across the country - from Glens Falls to Albany and New York City to Los Angeles.